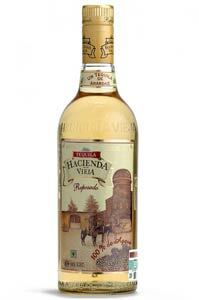 Tequila Hacienda Vieja Reposado is a product of Los Altos de Jalisco and owned by the Bañuelos family, one of the most widely recognized families of Arandas and those who have been involved in the business of agave tequila and for many years.Don Felix Bañuelos, successful businessman, migrated to the United States at the age of 17, where he worked for a while. Upon his return to his homeland acquired a grocery store where she worked for a couple of years. Then, changing directions and founded a line of transport in Guadalajara covering the entire Pacific with their routes. Seeing an opportunity in the sweet went to the town of Arandas and beginning in 1960 one of the strongest companies dulceras Mexico and important as Milk Products La Vaquita and I work until 1980 when it was sold. In 1973, FELIX DON BAÑUELOS started in the industry tequilera founding a major company that became a leader in Mexico and the United States. The experience of FAMILY BAÑUELOS in the tequila industry goes beyond 29 years, which is why "More than a Tequila, a Tradition" governs our origins. Hacienda Vieja is a tequila produced under the strictest standards of quality procedures v using AGAVE SELECTO owned by the family BAÑUELOS at its optimal stage, following further the process of double distillation. Hacienda Vieja is aged in white oak barrels for a minimum period of 90 days and is produced in the original distillery where FELIX DON BAÑÜELOS began as tequilero in the 70's. Hacienda Vieja so far remains under the control of the BAÑÜELOS FAMILY.